I’m back!!! I hope everyone is having a good week and enjoying their crochet projects. Anyways, august was a little crazy month for me. I had to deal with my former school for another transcript of records that they don’t want to release but just last week they have decided to process it anyway. So, now I am waiting for it. Okay, enough with the drama. As I mentioned on the last few blog entries (I think I did mentioned) my sister is expecting a baby girl. I promised her before the pregnancy that if ever she will be pregnant, I am going to make 12 pairs of baby booties. Well, I started last week and finished 3 pairs…. 9 more to go…. I am running out of idea. I followed sole pattern from the Youtube video for Mary Jane slipper. I want to share the FO! Tada! Thank you for reading this post and have a great day! 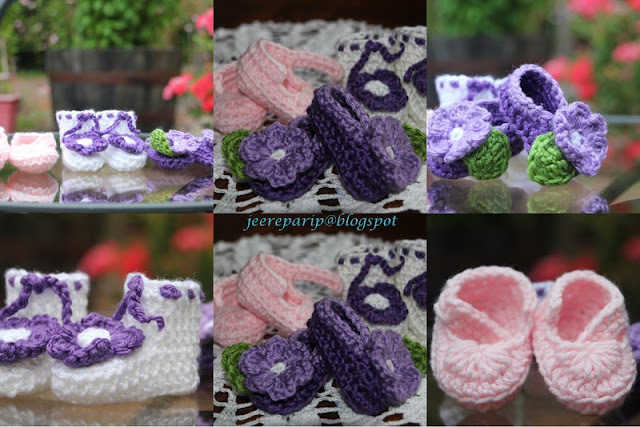 favorite colors for baby..so sweet..
Hi Jee Q, Thanks for visiting me and joining my blog. I like your crochet especially the bikini cover ups and the FBB. Congratulations to your sister. Can't wait to see all 12 pairs of booties. Keep in touch. Nice booties Jee Q! I am also planning to make Mary Jane slippers for one of my daughters dolls.